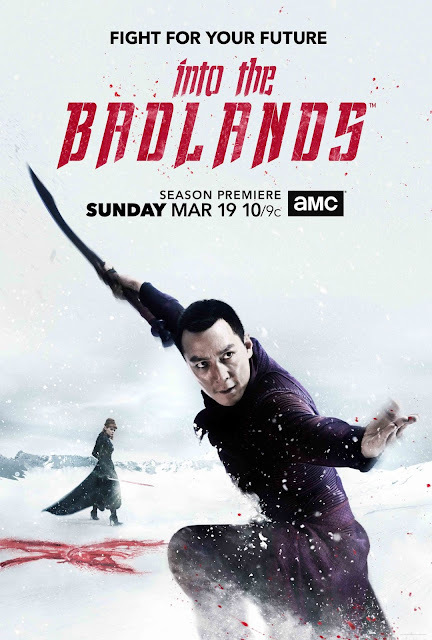 Chrichton's World: Review Into the Badlands Season 2: For the most on par with the first season but somewhat disappointing finale! Review Into the Badlands Season 2: For the most on par with the first season but somewhat disappointing finale! Season 2 of Into the Badlands have most of our favourite characters are in some nasty predicaments but of course people like Sunny are very unlikely to give up. Especially since now more than ever he wants to be with his family. The power struggle between the barons is in full force and The Widow is more relentless than ever. Tilda has made up with her mother and is even more loyal than ever as to make up for even having considered betraying and leaving her. M.K. is not in immediate danger and seems like he is in a place where he finally gets to control his dark power. And yet they are not in a real hurry to teach him this. Veil and her new born son are safe and sound but in very unexpected and unpleasant company that make her want to flee from the place they are residing. Not going to reveal this since I want to keep this spoiler free. Apart from the little introduction. For the most part I really enjoyed this season. It was action packed, had some nice interactions and dynamics and was a little darker and gloomier. However it also felt like it didn't go anywhere. It was more of the same and apart from the Sunny arch there didn't seem that much progressed made. Only a few times new things get revealed and when they do they lack impact. My guess is that either they want to play it safe and keep the story as minimal as possible so that they can focus on the action or they are saving it for the third season. Problem with this approach is that (at least for me) the emphasis is more put on the power struggle between The Widow and other parties while Sunny and M.K. aren't directly involved with them anymore. Don't get me wrong, Minerva is easily still one of the most interesting characters in the show but without them doing real outrageous or extraordinary things it's not that compelling to follow. In the first season M.K. 's dark power was a very important element. Now it has been reduced to the extent it hardly matters. Until the plot begs for it to matter again. It felt a little artificial to me. But that is something I was willing to overlook. What really bugged me was the way this season ended. For some unknown reason they went the typical tragic Wuxia route meaning some major melodrama was put into some events. Now I don't mind it if the build up and devastation is done right. Here the pacing up to these events was frustratingly slow and predictable. And in my opinion totally unnecessary. Although it has opened up a new dynamic reminiscent of Lone Wolf and Cub. That should not surprise anyone since the creators of the show were influenced by that. Let's see how that will work out next season. For the rest the season finale didn't offer any other twists and turns which was a bit of a let down. I will still be checking out since the martial arts still is top notch and most of the characters are still likable and interesting. But I do hope they will improve on the writing because it's very much needed.